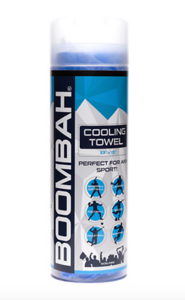 Stay cool no matter the activity with the Boombah cooling towel. Stay cool no matter the activity with the Boombah cooling towel. Cut the towel to whatever size suits your needs. It'll stay cool for up to 3 hours while helping to lower your body temperature and keep you dry.